SpaceX successfully launched the Falcon Heavy on February 6, 2018, at 3:45pm EST (20:45 UTC). Through a waterfall of cascading fire and smoke, SpaceX successfully launched its first Falcon Heavy, the most powerful rocket in operation anywhere in the world, and second only in strength to the Apollo-era leviathans that took crews to the moon. SpaceX successfully launched its Falcon Heavy rocket from Cape Canaveral, Florida, and the live stream of the event was the second biggest in YouTube’s history. The event reached over 2.3 million concurrent views on YouTube, coming in second to the Red Bull Stratos jump, which racked in a ridiculous 8 million concurrent views back in 2012. Earlier, America's SpaceX company successfully conducted a key test ahead of the maiden flight of its new rocket - the Falcon Heavy. Falcon Heavy is a reusable super heavy-lift launch vehicle designed and manufactured by SpaceX. It is a variant of the Falcon 9 launch vehicle and consists of a strengthened Falcon 9 rocket core with two additional Falcon 9 first stages as strap-on boosters. As of date, Falcon Heavy is the world's highest capacity rocket superseding the Delta IV Heavy payload to LEO by over a factor of two. 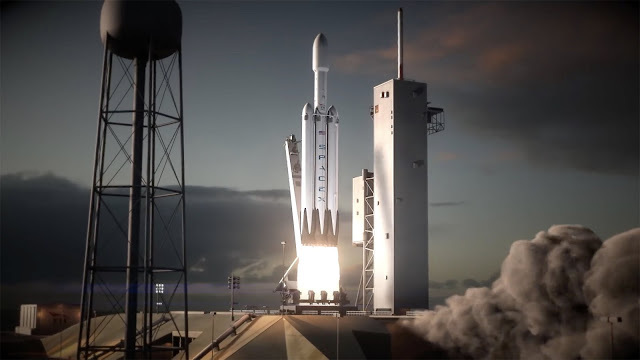 Falcon Heavy was designed from the outset to carry humans into space and would enable crewed missions to the Moon or Mars. The dummy payload on its maiden flight was SpaceX founder Elon Musk's Tesla Roadster and a mannequin in a spacesuit nicknamed Starman. In what is known as a static firing, all 27 engines on the launcher's first stage were ignited together to check they are flight-ready. The procedure, conducted in Florida, lasted only seconds and the rocket was clamped to keep it on the ground. So in news everywhere is - US entrepreneur Elon Musk launching his new rocket, the Falcon Heavy, from the Kennedy Space Center in Florida. The mammoth vehicle - the most powerful since the shuttle system - lifted clear of its pad without incident to soar high over the Atlantic Ocean. It was billed as a risky test flight in advance of the lift-off. The SpaceX CEO said the challenges of developing the new rocket meant the chances of a successful first outing might be only 50-50. With this debut, the Falcon Heavy aims to become the most capable launch vehicle available. The aim was to send the car and mannequin towards Mars' orbit It is designed to deliver a maximum payload to low-Earth orbit of 64 tonnes - the equivalent of putting five London double-decker buses in space. Such performance is slightly more than double that of the world's next most powerful rocket, the Delta IV Heavy - but at one third of the cost, says Mr Musk. For this experimental and uncertain mission, however, he decided on a much smaller and whimsical payload - his old cherry-red Tesla sports car. A space-suited mannequin was strapped in the driver's seat, and the radio set to play David Bowie's classic hit Space Oddity on a loop. If all phases of the flight are successful - and that will not be known until at least 6.5 hours after lift-off - the Tesla and its passenger will be despatched into an elliptical orbit around the Sun that reaches out as far as the Planet Mars. 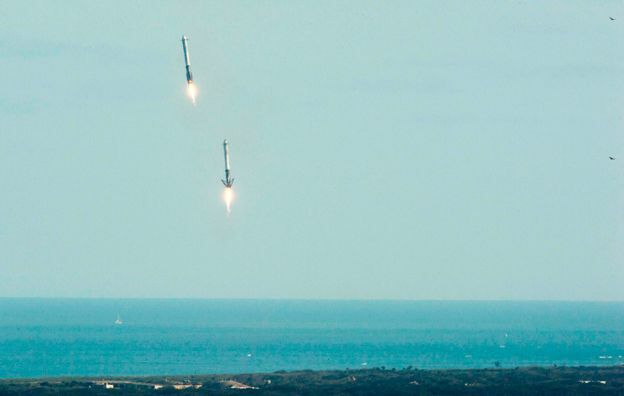 Later news state that two boosters have come back to touchdown zones on the Florida coast just south of Kennedy; the third booster was due to settle on a drone ship stationed several hundred kilometres out at sea. During the launch, the video signal from the drone ship was lost, so the fate of the third booster is not yet clear. The upper-stage of the Falcon Heavy, with its Tesla cargo, began what hopefully will be an escape trajectory to Mars' orbit. That requires the engine on the upper-stage to fire on three separate occasions, with the third and final ignition only occurring after a long cruise phase. Mr Musk warned before the flight that this was one of the phases he was most concerned would not work properly. The upper-stage has to pass through a concentrated region of radiation above the Earth, known as the Van Allen Belts, and this could interfere with electronic systems. "It'll be game-over for all other heavy-lift rockets," he told reporters on Monday. "It'll be like trying to sell an aircraft where one aircraft company has a reusable aircraft and all the other companies had aircraft that were single-use where you would parachute out at your destination and the plane would crash-land randomly somewhere. Crazy as that sounds - that's how the rocket business works." Further update puts it that though the Falcon Heavy’s outer cores successfully landed after launch this afternoon, the middle core of SpaceX’s huge rocket missed the drone ship where it was supposed to land, a source tells The Verge. SpaceX later confirmed The Verge’s reporting in a press conference. The center core was only able to relight one of the three engines necessary to land, and so it hit the water at 300 miles per hour. Two engines on the drone ship were taken out when it crashed, SpaceX CEO Elon Musk said in a press call after the rocket launch. It’s a small hiccup in an otherwise successful first flight. The man at the start - Elon Reeve Musk is a South African American business magnate, investor, engineer, and inventor. He is the founder, CEO, and lead designer of SpaceX; co-founder, CEO, and product architect of Tesla Inc.; co-chairman of OpenAI; founder and CEO of Neuralink, and founder of The Boring Company. He is also a co-founder and former chairman of SolarCity, co-founder of Zip2, and founder of X.com, which merged with Confinity and took the name PayPal. In December 2016, Musk was ranked 21st on the Forbes list of The World's Most Powerful People. As of January 2018, Musk has a net worth of $20.9 billion, and is listed by Forbes as the 53rd richest person in the world. His goals include reducing global warming through sustainable energy production and consumption, and reducing the "risk of human extinction" by establishing a human colony on Mars. 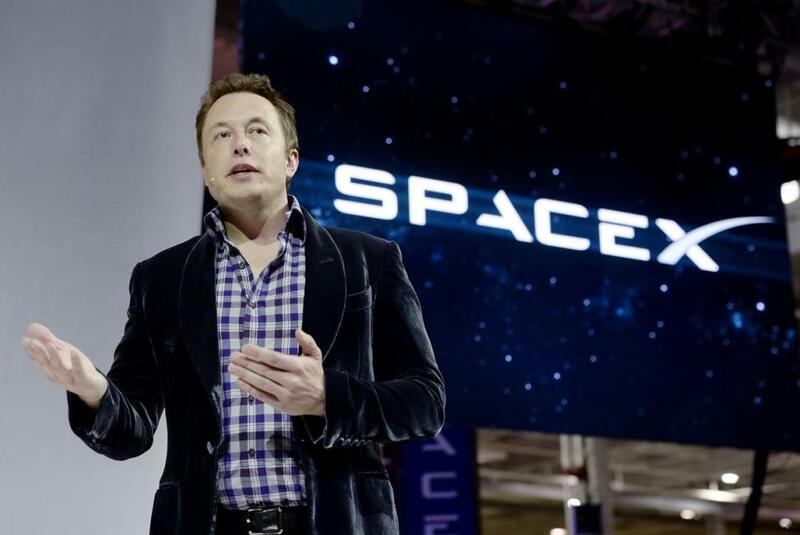 In addition to his primary business pursuits, he has envisioned a high-speed transportation system known as the Hyperloop, and has proposed a vertical take-off and landing supersonic jet aircraft with electric fan propulsion, known as the Musk electric jet.